I believe very much that, for any true student of theology wanting to grow in their pnuematological understanding, especially for all continuationists, then an extremely solid resource to own is Gordon Fee’s work, God’s Empowering Presence: The Holy Spirit in the Letters of Paul. Fee, himself is a New Testament scholar and professor emeritus from Regents College in Vancouver, Canada. He is also an ordained minister in the Assembly of God church. You can read more of his credentials here. Nevertheless, this book is a treatise unlike many others, standing in at just over 900 pages long. So I would say this is more a study resource, rather than a bed-time read. What is truly unique about the book is that it analyses every single mention of the Holy Spirit and his work within the letters of Paul. Fee doesn’t start with Romans (as that is the first Pauline letter in our NT canon), but rather with 1 Thessalonians, which is considered one of Paul’s early letters. He then moves on to 2 Thessalonians, 1 Corinthians, 2 Corinthians, Galatians, Romans, Philemon, Colossians, Ephesians, Philippians, 1 Timothy, Titus and, finally, 2 Timothy. 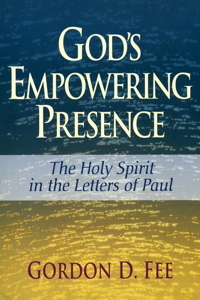 The last 100 pages or so deal with important theological topics on the Holy Spirit including such themes as the Spirit as eschatological fulfilment, the Spirit as God’s personal presence, the soteriological Spirit, the Spirit and the people of God, and then answering what all of this Pauline pneumatology means (which includes touching on Old Testament and intertestamental pneumatology). And, of course, there is an extended bibliography. You can see that some of this work implements his writings from other works, like his commentary on 1 Corinthians or his work, Paul, the Spirit, and the People of God. The only pneumatological resource that could be considered better is if an author took up the challenge of providing commentary on every verse in the New Testament that speaks of the Holy Spirit and His activity. Maybe it’s out there, or maybe it will be released one day. But I suppose that would be at least a 2-volume work weighing in at a 1500+ page length. This entry was posted in books, Holy Spirit, pneumatology, resource and tagged books, Gordon Fee, Holy Spirit, pneumatology, resource. Bookmark the permalink. I agree. It is equally the best book of it’s kind. Fee is in a class of his own and writes from a depth of practical as well as theological experience that surpasses any other NT scholar. Every student of theology ought to own this book. — First, no offense, but you have things a bit backwards regarding the relationship between GEP and “Paul, the Spirit, and the People of God.” GEP came first, and PSPG was an extensive reworking of the last several chapters for a more “mass market” audience. It regularly refers the reader to GEP for exegetical details. — Secondly, in the preface to the latter (i.e. PSPG), Fee acknowledges it has the “weakness” (his own word) of not comparing Paul’s “Spirit” teachings with others in the NT. He goes on to say, “Hopefully, it will stand alongside other books of its kind: by Gary Burge (for John); James Shelton (for Luke-Acts); and Gerald Hawthorne (for Jesus).” I believe he is speaking of, respectively, “The Anointed Community,” “Mighty in Word and Deed,” and “The Presence and the Power.” The first of those deals with the Johannine corpus, and has the academic tone of GEP, the last deals with the words of Jesus throughout the NT and has a “mass-market” tone more like PSPG, and the middle one deals with Luke’s two volumes in (what I recall to be) a rather mid-range sort of tone. — It may also be worth mentioning that in the Introduction to his academic book, “The Spirit in the Gospels and Acts,” Craig Keener expresses the hope that it will “in some small degree” serve as a complementary work to GEP. Unfortunately (in my view), he does not emulate Fee in dealing with each individual “Spirit” passage. With your point #1, nothing was stated as to which came first. I can look at publishing dates at the beginning of a book. 🙂 It was simply noting that you will find “cross-referenced” material across the 3 varying works. I appreciated this academic work – The Holy Spirit and Spiritual Gifts by Max Turner. It looked at a larger context of the work of the Spirit, at least in the NT, though it does touch on OT/intertestamental stuff at the beginning.